I'm revisiting the design of my proposed home yet again. Yes, I know this gets boring. But it's probably the biggest decision I'll make in the next ten years - I need to get it right. I do like the four dome design - the design I've called 'sousterrain' - I've been working on over the past six months. It's scupltural and elegant. I think it would have elegant internal spaces. Because it's modular, you can add on modules; you can build only part of what you intend in the first phase, and live in that while you build more. Which I would need to do, since I can't afford to build it all in one phase, either in money or (probably) in time. It's also very challenging for the policy driven, risk averse, conventional planning authorities; but frankly anything I design or want to live in will be, so that's almost a non-issue. However, there are a number of arguments against the sousterrain design. The first is 'food miles'. I came up with two possible constructions, one of which was engineered plywood, the other of which was concrete elements cast in engineered plywood moulds. Plywood is a wonderful engineering material from which you can make elegant, strong, light structures. But it is mostly made from rainforest timber and one really has no assurance that the forest is sustainably managed. And it's been shipped half way round the world. It's also quite an expensive material - the four dome design in plywood came out at £20,000 for the shell structure alone, which probably makes it unaffordable to me. It's because it's an exotic, highly processed material that it's expensive. Building the four dome design in concrete is much cheaper, despite the fact that a great deal of plywood would still be required for the moulds. Concrete is an amazingly cheap material, in financial terms. But it isn't cheap in energy terms. Making the cement for concrete embodies a huge amount of energy, with a very real carbon cost. And, in any case, it isn't made locally - from the point of view of Galloway it is again an exotic material, one which is shipped in. I've been reading a lot of books about dwellings written by hippies lately. Mystics. People who feel that there is inherent merit in building in the stuff of the landscape in which they build - in wood and stone from the site itself. It's a romantic idea. But, beyond that, it's how most houses were built prior to our parents' generation; and, in all likelihood, how most houses will be built after our childrens'. In actuality, I could build with the materials of my own croft - obviously I could, people have been building dwellings in Galloway for four thousand years. But I am, although a hippie, a pragmatist, I hope, not a mystic. I could take the timber to build from my own wood. There is (easily) enough timber there - even for an all-timber structure. Next, I could build the masonry parts of my building from field stone, as the people of Galloway have since the bronze age. On Standingstone farm, Auchencairn, I'm not short of stone. Now that really is practical - the embodied energy is significantly lower than building in concrete, and the stone costs me nothing except labour. I really could do it. Of course, I would still have to use cement or lime mortar, so the masonry isn't 'free' either in financial or energy terms, but it could be done and it would be better. The problem with using my own timber is that would take a year to season, and that means either I would be living in something temporary for the winter, or else burning my building money renting winter accommodation. And it would take milling, which would mean that either I would need to buy a mill (not cheap) or hire one of my friends who have mills to mill it for me. In practice I can buy timber of similar species and quality to my own timber for little more than the cost of using my own, and, provided I get planning permission, can build this year. But note - this is timber, not plywood. Plywood I don't have the ability to make. The problem with using my own stone... The problem with using my own stone is that an underground or earth-sheltered dwelling in Galloway has to be very waterproof. Very. Of course, waterproof membranes are not native to Galloway, which is why Galloway people have historically not built earth sheltered dwellings. Traditional houses in Galloway did have high quality insulation in the form of thatch; and it's possible to insulate houses with wool, which also is produced in Galloway. But I do plan to use waterproof membranes, and the waterproof membranes I know how to use are designed to be stuck on smooth, flat surfaces. So I'm inclined just to use conventional concrete blockwork for my walls. Yes, it's embodied energy and it's an exotic material. But it's a heck of a lot quicker and easier and I end up with a reasonably smooth flat surface to which I can stick membranes which I know how to use. Outside that surface I'll use sheets of extruded (closed cell) polystyrene foam - another exotic material embodying energy - both as insulation and to protect the membrane from the soil. I'd already decided both those points when working on the four dome 'sousterrain' design. I don't need to revisit them. After all, in the front of my dwelling I plan to use glass. It, too, is an exotic material, embodying a lot of energy, but I don't see many people too purist to use it! OK, so, plywood I can't afford. Using a lot of concrete niggles at my eco-wannabe soul. And the costs of my designs - while not high, by the standards of modern housing - are hard to square with my budget. I need to rethink. The shape which encloses the most area for the least edge - wall - is a circle. A circle is also the easiest shape to heat. And that takes me to yurts, about which I've been thinking a lot lately. Yurts are very simple and elegant structures. I've already decided that if I absolutely cannot get planning permission, a yurt is the way to go. Having slept in a yurt, I'm confident I could be comfortable in one. But it would be cramped. Even a large yurt of six metres diameter is only thirty square metres. Going up beyond about six metres you have a problem with the span of the rafters. One American architect in one of the hippie books or websites I've read recently (I'm afraid I don't recall which one) solves this problem by arranging concentric yurt structures, with, essentially, intermediate tension rings supported by pillars. This is actually very similar to the design of round houses used by some native peoples of the south-eastern United States, and similar also to what has been inferred from post-hole evidence as the structure of a typical iron age dwelling in Britain. 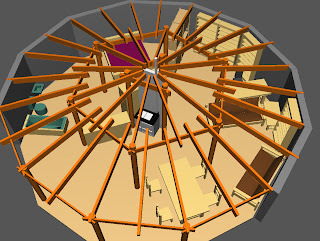 A single circular space with the floor area of my four-dome structure - sixty square metres - would be slightly less than ten metres in diameter, or slightly less than five metres in radius. Which means two 2.5 metre rafters would span it with one intermediate tension ring. When I started thinking about this structure, I thought, as a western educated person, that naturally you'd run the two rafter sections coaxially, one in line with the other. But actually if you do that you get an incredibly complicated joint at the top of each pillar - a joint which it would be hard to make and harder to make strong. But if you offset the rings slightly, so that while each rafter is still radial to the structure it is no longer coaxial with the rafter up-roof from it, the whole structure becomes a lot easier to make, and also gains a subtle twist to the geometry which is elegant in a very unwestern way. I'm still - or, indeed, still more - resistant to the idea of internal partitions. I see this design as essentially a single space; I think its geometry demands that. But it's obvious that the stove needs to be at the centre, to provide even warmth. And it makes sense to put a (large) hot water tank also in the centre - since the hot water tank also forms part of the thermal mass which keeps the dwelling warm. A traditional yurt has two pillars supporting the ring into which the inner ends of the rafters fit; I've designed a triangle of three pillars. This triangle defines the 'warm core'; it contains the stove (facing south, towards the sun, and therefore the day side of the dwelling) and the water tank (behind it, to the north, in the night side). North of the warm core is the most shaded and most private space, so it makes sense to put the bed there. It will be most welcoming if the floor between the entrance - the south, glass, wall - and the stove is largely clear. Kitchen preparation area is obviously needed near the stove, and should form one edge of this clear space. A dining area should also be near the stove and forms the other. Further back, the bath area needs a certain degree of privacy - not a great deal, since there are no near neighbours, but some. It makes sense to put this to the west, as there is some shelter from people approaching from the east. A work area needs protection from direct sunlight, which is hard on the eyes - but, at the same time, it's nice if there's a view. So it needs to be further back in the dwelling, and it makes sense to put it on the east. This is still a design to be built into the hollow I had already identified as the sousterrain site. It's still a design which will be earth sheltered - have earth covering the entire height of the north, east, and west sites; whose roof will be covered with turf; which will have 'patio door' sliding windows in its south wall, rather than a door as such. It's still a design which is intended to be inconspicuous in the landscape - although the low cone of the roof will be more obviously unnatural than the shapes you'd get from the four domes. I started drawing this structure really as an experiment in exploring alternatives. What's startling, though, is how inexpensive it is. The materials cost of the shell works out at £6,020 - as against £11,999 for the four dome design in concrete, or £20,180.68 for the four dome design in plywood. Furthermore, while making the domes or the moulds for the four-dome design would need extremely careful finely detailed joinery, the 'singlespace' design is all simple carpentry. Unskilled people could actually help in building this. And, because it's simple, it could be built quickly - getting the shell completed in one summer season does not seem unreasonable. I'm now thinking of this design as my probable structure. Of course the verdammt planners won't like it any more than they would like the four dome design, so planning permission is still a major headache - but I don't think it's a worse headache, just something that has to be tackled.